Successfully Added 3G Android Tablet - Quad-Core CPU, 9.7-Inch HD Display, 3G Support, WiFi, Dual-IMEI, Bluetooth 4.0, 5000mAh Battery to your Shopping Cart. This cheap Android tablet is the perfect gizmo for students and first-time tablet users. With its sleek and lightweight design, this tablet PC can be easily carried around anywhere you go. It runs on an Android operating system and comes with a Quad-Core processor. Thanks to this, it is capable of handling games, movies, and office programs. This Android tablet computer is great for work, study, and entertainment alike. On its 9.7-Inch HD display, it treats you to crisp and detailed resolutions. No matter your tablet demands, this gizmo will meet them all. What really sets this Android tablet apart is the fact that it comes with Dual-SIM and Dual-IMEI support. This means that you’ll be able to slide in a SIM card in order to call, send messages, and stay connected to the web at any time. By supporting 3G network frequencies, this Android tablet will significantly increase your overall connectivity. From now on, you’ll be able to browse the web, stream media, and download files anywhere you go. This makes the tablet PC particularly useful for study and business purposes. 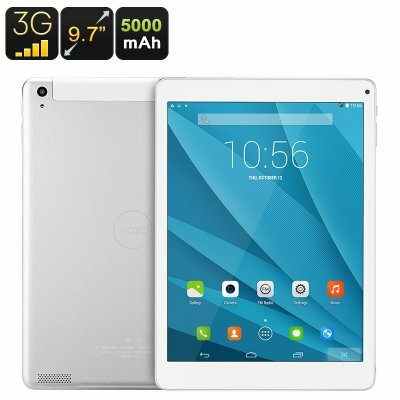 With its 5000mAh battery, this Android tablet PC brings forth 4 hours of continuous usage time. Therefore, you won’t have to worry about being bored ever again. With this Android tablet computer at your disposal, you’ll be able to carry along your favorite media anywhere you go. It treats you to 16GB internal storage and a 32GB SD card slot. This means that there will be enough memory to store media to keep you entertained for years to come.